Given that this is the holiday season, we stop, supposedly and reflect upon what has made this year special, what has made this year memorable. Of course one of the greater stories is the rise of Twitter and the rise of the now ubiquitous term “Social Media.” Companies are now hiring social media managers because it takes a lot of time and effort to keep putting that message out on channels which the public now “listens” to and spends time on & with. Twitter and Facebook spring to mind. What is the ROI? This phrase was sung over and over again, “How do we make money on it?” Slide Shares were created which amused and enlightened, @thebrandbuilder's recent slideshare, hilarious to look at had a few key points which discussed this – but the bottom line was on slide 44 that attention to the brand will create traffic to the site which will increase sales,…. ultimately. Social media managers who can raise awareness through being followed by brand leaders, who can come up with a new way of attracting friends and fans to Facebook are important. It is an interesting time. One that MySpace wishes it could really be a part of. Or the way the cute little red headed girl in school you liked always had Charleston Chews, and so to impress her, you began to stock up on it. We are socialized into brand affiliation early in our lives. The media holds the message, so thrown out wrappers of candy in the playground aren’t technically media but they represented another impression upon our young minds. So when we are talking about the Return on Social Media, aren’t we also talking about how we are going to get that media to become the message to get people to want to buy our goods and services? Especially now that attention is split to near atomic levels, and marketers with budgets being cut in this new economy are looking for new ways to engage their audience. We are no longer held captive at the dinner table so to speak with 4 networks, no longer in the walled in playground of printed content. We are out there and we are spinning our own stories. How can we, the marketing and advertising community get people to listen and buy? Was MySpace worth $650 Million? Is Twitter worth $100m? Club Penguin $750m? Don’t those huge valuations tell you something? That even in this world of a million channels, there is limited opportunity for investment in this arena. So that means this arena has a lot of users but they are funneling towards a few channels. I think that we should wait and see how the Social Media marketplace works out ultimately. And to do this takes a longer view. In this economy we don’t have the luxury, but in this economy we don’t have the luxury NOT to as well. Social Media spend is both increasing and paying off. It is a longer term investment because it deals with a human investment. As reported in Marketing Vox, “New figures from an Econsultancy study show these channels are becoming more important to marketers. In the newly released Social Media and Online PR Report, Econsultancy and bigmouthmedia found that more firms are planning to increase social media spending next year and - more intriguingly to those loitering on the sidelines of this space - that those firms that have focused heavily on these channels have made it pay off." An overwhelming majority of companies (86%) surveyed plan to spend more money on social media in 2010, and a further 13% are planning to keep the same budget levels. The report does go on to say that those companies who have efforts in this area have typically reaped some reward. More than half (52%) who are heavily involved in social media advertising say that they have gained real value, compared with only 13% of companies who have "experimented but not done much." Marketing Vox goes onto discuss the new tools including the Push to Social for email enabling crossover of platform. A.J. Leibling said “The power of the press belongs to those who own one.” In this day and age we all own a press each time we hit submit, what we need are those eyes to read and digest what we are writing. What we need is a community to share that with, and this kind of human investment does take time. It is Holiday time, and though we will be involved with Twitter and Facebook telling “everyone” what we got for Christmas, it is also time to spend it with those from whose social sphere we migrated, namely our families. In other words, the potlatch which is in the form of gifts to the community is what will replenish the individual. Was it a form of investment? Clearly so, in terms of a families status and also in terms of actual goods for consumption, food and sundries. It was a return on human investment. It was built up over time, and so will this return on Human investment we make in the social media community we belong to be. 27 million tweets a day and counting. You can hear us “singing” as soon as you tune in. Engaging people is what will pay off. Of course there are other ways to engage, and my prediction for the next decade is to the virtual worlds which are 3D and dynamic, which have people at the edge of their seats and tips of their fingers as the next big frontier for advertising and brands. In the first quarter of 2009, the virtual world of Second Life saw $120 million USD exchanged through user-to-user transactions, with a record monthly $45 million USD in transactions in March. This is where the product meets the grid meets the people. Virtual assets which people will buy for real money to enhance their virtual lives or virtual social media lives. If Twitter could come up with a monetary widget that people could buy for one another in micro transactions would they do it? And I come to the question is social media = virtual media? Are we living virtually through this media – this glimpse into other people’s lives, thoughts, drives and observations? We are investing hours of time on blogs, Twitters and posting onto Facebook. We want to be heard, we want our thoughts and observations shared, we are part of the greater potlatch of contemporary media and this virtual society at large is one we feed and feed on. How can you measure the time we spend on answering emails, in LinkedIn group discussion and monitoring our inbox in a quantifiable way? We read what we want, when we want and for how long we want to - we are caught up in a tide of finding things out and broadcasting what we have discovered. The return on investment for time is knowledge and entertainment – this is a new form of activity, broader and with farther reach but still a human activity, we are around an electric campfire now sharing stories, information and modern lore. Word of mouth is the most important form of advertising there is today - our attention level has been spliced, and so we trust in that most ancient of organizations, our friends and extended family. The return on human investment is indeed a return on time spent acquiring knowledge about areas we want to be a part of. What is the price on knowing? What is the price on being heard? In many ways my potlatch is on Second Life. I still Twitter though, follow me @pookymedia. Document of Time - Interview with Holocaust survivor Fanny Starr who endured the full six years of hell and living in deplorable conditions. Fanny Starr’s liberation day occurred on April 15, 1945. The British Army liberated Bergen Belsen concentration camp. Ms Starr answers questions about her lifetime and wartime experiences in a revealing interview which captures on record one of the most appalling times of human history. These are the answers to questions she had to answer to make the world aware and for the sake of record. Music - Kol Nidre performed by Hazzan Dov Kaplan. Scorpinosis Nightfire interviews Pooky Amsterdam. From IdeaJuice Studios, Pooky gives dialogue and voice to a charming little genie with quite an accent in this beautifully done machinima by CodeWarrior Carling. A great collaborative piece, filmed in iClone. Sit back and relax has become lean forward and engage. Streaming video and music will generate more than $78 billion in network-derived and content-derived revenue over the next six years in the United States, according to a recent study by The Insight Research Corp. Streaming media refers to the transmission of digital audio and video files over an IP network or wireless network in real time or on-demand, while prohibiting users from storing the files locally. While ad spending has been affected by the recession, this figure below is of great interest to note: Spending on in-game advertising will reach $1 billion by 2014, media analysis group Screen Digest said in a new report. For me, there is not much of a jump from in-game to in-world, and the 3D immersive one Second Life is. “The ever-changing landscape of new platforms and technologies that enrich interactive advertising guarantees this growth trend will continue.” IAB President and CEO Randall Rothenberg mentioned a few years ago. What PookyMedia is doing encompasses fully the new new media platform and technology such as Second Life. PookyMedia is creating digital product: delivering engaging and targeted video which is dynamic and extremely cost effective. Entertainment, which captures either a live show where the audience is literally at the edge of their seats, or in meaningful video, that has the look and feel of something new, special and beautiful. Plus real people can take advantage of the very local destination known as their home to log into Second Life. It becomes relevant, easy to access and fun. This is a remarkable combination to offer people. The flat 2D web is rapidly becoming passé. The new 3D immersive environment is where consumers and thus advertisers are moving too. We have a unique opportunity to offer people something special to really make this kind of community resound. We must know the best way to do this. A recent study from Forrester research found that 57 percent of advertisers plan to spend less on TV and more on web advertising such as online video and visually, socially, and interactively rich media. With more and more money transitioning from offline channels like television, online marketers have an opportunity to show how online video can provide measurable results. It is more than just “watching” that the public wants. They are going where they are involved, evolved and in control. The more of this you offer the more likely the public is to return. 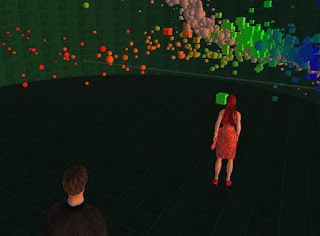 We must tap into the zenith of user generated involvement, and we can do that in Second Life. Media content and distribution companies realize that the one thing that seems to matter the most in the 21st century media environment where attention is sliced at near atomic levels, is association with a brand. But we are at saturation level for images, how can commercials or marketing messages be edited any tighter? How do we tap into marketing here without being clicked off, avoided or negatively portrayed for leaving no vestige ad-free? One way is by involving people in the product itself while giving a reward for that involvement. Rewards can be defined in many ways even beyond entertainment. Tapping into meaningful dialogue, relevant social issues, charity, group activity and yes of course traditional laughs all are possible, it is what PookyMedia is doing. Being able to do this in a 5 minute video extends the depth of a 60 second commercial, being able to do this in a 30 minute game show is memorable fun and having a community built up for a cause or focus brings hours of engagement. Plus the costs of doing these things is lower by many factors of 10. Worth it? You bet. The drive to monetize social media is something that everyone is very interested in. According to a very recent Nielsen, social media has overtaken email as the most popular online consumer activity, giving it exceptional reach — increasingly among users between 35-49, and 50-64 years of age. Relationship-wise, social media enables a broader array of personal connections and peer contact, giving users reason to visit such sites regularly and over an extended period of time. Finally, the content and desirable connections compose social media's personal relevance to consumers — making it ideal for advertisers who know how to target their markets. People go to a social media site and offer themselves to some extent as the ‘brand." Lets face it –it is their own lives and the lives of their friends or people who appear interesting that they are involved with. The internet is a tricky place to advertise though. Facebook isn’t making any money really and MySpace just laid off 30% of it’s workforce. But it does support the view that social media type places – the gathering wells, the online destinations, are a good place to reach people. Not so much water cooler as watering hole, where people go for some refreshment, and can spend hours of their time in a socially stimulating environment that also offers opportunities for advertisers and consumers alike to interact and be enriched. We might have gotten to a point where we have just been oversold, and we aren’t going to buy it anymore. Coupled with an increasingly dire economic outlook, advertisers are going to have to seek meaning once again with their, dare I say it- “constituents.” When you view the people who are going to cast their increasingly valuable economic vote for you, as constituents, you must look at them differently. I believe it is time for the world of marketing, which is fueled by advertising and products, to take a deeper look at these trends. Second Life provides a perfect opportunity for this because people are able to get there for free, from anywhere in the world, any time they want to enjoy the social experience of real time interaction. What the marketing community must realize is that Second Life is a social media platform, and that in order to tap into this they must offer something to spend time with. This is what PookyMedia does with the original shows which are produced and broadcast into which branded content, product placement and audience involvement can take place. We also create series of shows and commercials which companies can brand as their own, again serving as a vital way to engage targeted customers. PookyMedia can also craft a branded community on Second Life around an event or series of events which enable and record people actively engaged with the product. This becomes part of peoples' lives and reflects back onto that which they are involved with. Personal interaction extends the branding identity and grows the community which sponsored it.The 3D web is the future of audience interaction. Viewer log in entertainment, being a part of a community and identification with it, is what will work in this century. It’s right here, right now and PookyMedia is able to deliver this to you with a wealth of experience in production. We are surfing the zeitgeist. Catch this wave. Recorded at ReLaM, Relocatable Laboratories in the Metaverse, sponsored by the KIRA institute asked Pooky Amsterdam to conduct a lecture on Second Life as a Media and Entertainment Platform. There are the ahead of the curve on Second Life, and the very astute and the very Brilliant. All of these qualities are in abundance in one of Second Life’s most illustrious residents, Curious George. He actually raises the world we are in simply by being so much a part of it. He is one of the driving forces behind The Meta Institute for Computational Astrophysics (MICA) a professional scientific and educational, non-profit organization based in virtual worlds. George is a Professor of Astronomy and a Co-Director of the Center for Advanced Computing Research (CACR) at Caltech. I had the great opportunity to sit down recently on StellaNova which is the base of MICA operations on Second Life with the man I call………….The Genius. Curious George: Please, sit down. Pooky Amsterdam: Beautiful furniture this is very comfortable. Curious George: Thanks! That's the idea behind StellaNova, make it a pleasant place for discussions and communication. Pooky Amsterdam: Yes the ability to 'make one comfortable ‘really on a visual plane helps the mind extend itself. Curious George: So aside from a few major venues - the amphitheaters, the seminar room - we have several of these discussion circles scattered through the sim. Pooky Amsterdam: Do you have any other venues which stimulate discussion- the club room is a classic do you have for example a pod in the midst of the galaxy? Curious George: No, we did not want to do any "space Disneyland" stuff -- plenty of that around. The idea is to have a natural and realistic park-like setting, the groves of academe if you will. Pooky Amsterdam: Classical in that sense and open air as well. Your goals of having a sim to foster discussion of the kind you just mention are important. Curious George: Yes, the idea of openness is conveyed throughout - no hidden spaces. Pooky Amsterdam: Though we do have hidden regions of the mind that thought & of course discussion will illuminate. Curious George: (smiles) Some of them, anyway. Pooky Amsterdam: How long have you been open? Curious George: We opened on Jan. 30, and we are starting to have a full schedule of events including the workshop tomorrow. (For a full schedule of workshops and calendar of events http://mica-vw.org/)But we certainly use the sim for our meetings, and I have seen many visitors come through. Curious George: We welcome anyone, and the environment is meant to be used for any and all scientific and scholarly interactions, discussions, etc. Pooky Amsterdam: Did you ever envision that you would be teaching, learning and collaborating on a place or platform such as this? Curious George: Now I of course see that, but before being introduced to VWs about a year ago, I was skeptical, like most academics, I think. Pooky Amsterdam: Yes of course- you have achieved a great thing here through your willingness to be open to it and will certainly lead the way. How are people you work with reacting to this. Curious George: It's fun to be exploring new and unknown territories, and VWs certainly are that. Most academics are oblivious to the change that this technology brings, so it will take a few years. Pooky Amsterdam: There really is little corollary in real life- lets all go on an overseas voyage & see what we want to discuss about, the universe? Curious George: Right now, most people assume that this is just some silly video games for adults. But that will change, as the VWs technology becomes more pervasive and people start discovering its utility. Pooky Amsterdam: Yes but have you been able to bring your colleagues into this- have they been intrigued? You work at one of the nations most prestigious universities in terms of technology. Are you vetting your colleagues before you approach them? Curious George: Not vetting, I just know who might be interested to try this, and I tell them about it. Some of them have already. We ask people to give MICA seminars and/or public lectures. Some colleagues, yes, but these have been selected as being potentially open to this kind of thing. Pooky Amsterdam: Great- this was my next question- you are using it both for international collaborations and also to bring events to the more general science community. Curious George: There is also the obvious use of SL as a collaboration platform, and I have used it for my research group meetings. As for the people we bring in as speakers, some remain active, and some don't. And we are about to start using SL for meetings of an international collaboration we are now starting, with groups at Caltech, in Italy, and in India. Telepresence technology like this makes a lot of travel unnecessary, and it is a very green technology because of that. And on a subjective level, as you know, it works better than the usual video- or teleconferencing setups. Pooky Amsterdam: Do you find that new people, new scientists are amazed at how they might "extend themselves" into an avatar? Curious George: Those who really take to it, yes. Pooky Amsterdam: Do you find it is a love it or don’t get it kind of thing? Curious George: Not sure, there is probably a spectrum of reactions. The technology is still fairly primitive. It will get a lot better, and then more people will "get it". What I mean is more effective 3-d graphics, and haptic computing to capture motions and facial expressions. And this will happen, for commercial reasons, probably first driven by entertainment, but then becoming ubiquitous in the same was as the web did, and perhaps even more so. Right now we simply transfer the ways we do meetings and lectures in RL into SL. We may yet discover better and new uses. Pooky Amsterdam: Hmm, how much does facial expression affect a lecture in RL? Will be very interesting to have a motion capture animation for a professor giving a lecture. Curious George: Yes, body language and facial expressions are crucial parts of our communication, and yet somehow, these cartoony and limited avatars do work better than videoconferencing. Pooky Amsterdam: We accept their limitations more readily somehow. Curious George: There is probably some good research to be done on this, by the people who study human perception, vision, etc. Pooky Amsterdam: Perhaps we are more exacting for "completely realistic." You have opened fairly recently here, what program have you been most excited about and what events are you looking to broaden your calendar with? Curious George: Well, MICA has been around since last April or May (2008), but StellaNova is new. We have started two new research discussion groups, in collaboration with KIRA, which is Piet Hut's other SL playground. Curious George: One is a group to investigate the use of OpenSim and WVs generally for numerical stellar dynamics. The other is a group called "Relocatable Laboratories in Metaverse", and the name explains it. These have weekly meetings I would like to start a couple more things soon. And another one will be a series of roundtable discussions on topics in computational science and technology. Pooky Amsterdam: Brilliant & again I would think that would need also graphics or some kind of representation. Curious George: One group we plan to start would be a research forum on immersive data visualizations. Pooky Amsterdam: Can you tell me about it what people will be looking forward to on Stella Nova. Do you find people open up that is become more inspired with out the barrier of the physical body? Is this more a purer mind experience- the ideas generate exponentially? What is KIRA? Curious George: OK, since you have been asking new questions as I have been typing the previous answer, let me rewind and answer the new ones in order: "what is KIRA?”: It is Kira Cafe, a group run by Piet Hut / Pema Pera, and it deals with matters of philosophy, spirituality, etc., and some aspects of science. Pooky Amsterdam: Fractals are for example, a program which generates images based on a specific kind of randomness , e.g. found in nature when you say you are looking at computations, I think why not use a scripting program to set up the parameters for what you want to see something like that or am I completely off the loop here. Would you use something like this? Some of us do modeling of stellar systems, e.g., star clusters, and there is some randomness in that, but it is all rigorously well understood and controlled; and then the output of these simulations needs to be visualized. Another aspect is visualizing highly complex data sets - some of which may appear random, but a goal of science is to discover patterns and structures. Pooky Amsterdam: Yes of course. Curious George: I am not sure if that answers your question, but to more on, "what people will be looking forward to on Stella Nova"? Well, several things: We continue our program of popular and technical lectures, We have these new interest groups that I mentioned, and more to come, We will be organizing interdisciplinary meetings to exchange ideas with scientists and scholars in other fields, and the workshop tomorrow is a bit like that. And finally, it is an open and inviting environment for people to come and use for their discussions, and hopefully make new contacts. Pooky Amsterdam: You “exponentially” broaden your idea group when you do this. Pooky Amsterdam: I find that fascinating & strangely enough builds some measure of trust so it has all the hallmarks of a great laboratory in this sense people accepting that "all in this together" and loosening up. Curious George: Speaking very generally, facilitating exchange of ideas is one of the most powerful engines of progress - in science, art, politics, and civilization in general. And SL is really good at that as this is all about human interactions. Now, the purpose of MICA is all that, but also something else. Pooky Amsterdam: Yes indeed I see a kind of renaissance happening because of this. Curious George: We need to establish such "scientific use cases" in order to bring in more skeptical academics. We need to find out what else is this good for, aside from the human communication aspects; so, for example, effective data visualization is a major scientific need - could this be a really good tool for it? Pooky Amsterdam: That is my question about scripting, that is can you run a script on this engine to determine patterns. Curious George: What you may be thinking of is what goes under a generic name of "data mining." And indeed, good data visualization is a key component of discerning patterns in the data. Pooky Amsterdam: To program a script to actually give interaction maybe more of a regression analysis type of engine. Curious George: There is even an emergent field of "visual data analytics". Computing within SL is not very efficient - it is not meant for that. Pooky Amsterdam: Ok I trust you on this one. Curious George: A more efficient approach is to do the computing on another machine, but visualize and interact in SL (or OpenSim, or some other VW environment). Pooky Amsterdam: People are more open & more willing to share here- so surely the collaborative aspect is going to "pay off" for lack of a better word. Curious George: I should point out that MICA is not SL-specific, we use SL as the most convenient platform for now, but we are really interested in a broader issue of the use of VWs for science and scholarship. OpenSim is thus one direction we are exploring. Pooky Amsterdam: What is the benefit there do you think? & then I will ask what are you most looking forward to in the near term either event or program & where do you see MICA in a year. Curious George: In SL you are limited by the LL servers in terms of the memory (e.g., the number of prims) etc. With your own machine, you can have as much as you can afford to buy, and use the VR visualization engine to look at it, as it were. Pooky Amsterdam: Are you planning on using prims for experimentation? Curious George: Let me illustrate this; let's go to the SE corner of this sim. You may have seen this, an early visualization experiment I did with Desdemona Enield. These are real data in a 6-dimensional parameter space plotted here. But there is only about 1000 data points, one per prim. In the data sets we are dealing with nowadays, there may be a billion data points - or even more. That's a bit too many prims for LL servers. So if we want to visualize a data set with more than a few thousand data points, we need our own server. Pooky Amsterdam: Yes why though in 3D for a data point? : I can understand if you needed it to explain something or have more than one set of info in it. Why not a flat picture? Curious George: We can do experiments in SL to see what works, but then do the real production on a custom machine. Pooky Amsterdam: It’s fabulous looking. Curious George: Why not a flat picture? Because the need is to visualize data sets in many dimensions, not just 2 or 3. Pooky Amsterdam: Ah yes to see where it isn’t spiked or peaked in 3D you see that better this way & may I ask what this data is representing? Curious George: This is a 6-dimensional data set; we know how to encode maybe a dozen dimensions; but the data sets we are exploring in astronomy now may have hundreds or thousands of dimensions. And in biology, there may be data sets in millions of dimensions. So a flat picture just does not work. Pooky Amsterdam: Do you think there are hundreds of dimensions? As there are many more colors in the spectrum that the human eye can see? Curious George: These are dimensions of a parameter space, not real space. Pooky Amsterdam: Are you sure? Curious George: String theory says there may be 11 dimensions, but that is a completely different story. What I mean here is: You measure a 100 numbers for each of a million objects, say galaxies, or some medical records, or whatever. Then you have a million data points in 100 dimensions. For this one, you can click on the sign to the left, to get a simple explanation card. Pooky Amsterdam: It’s a much deeper tool for knowledge & of course pattern mining. Curious George: Anyway, I hope that we can do much more complex data visualization than this. One advantage SL has is that I can interactively examine the data set, along with my collaborators. Curious George: Well, sit down, don't faint... :) Here's another one of our discussion circles, where people can sit down and talk about whatever data visualization is being displayed there. Pooky Amsterdam: May I ask you finally where you would love to see MICA in a year? Curious George: That is a good question, so: I'd like to see a broader buy-in by the academic community, getting engaged, experimenting with immersive VR, and how to best use this technology for its purposes; to have MICA as a forum and a catalyst for interdisciplinary exchanges of ideas in this arena; and also, to have it as a real, legally incorporated scientific institution, with its own funding, staff, etc. MICA is an experiment by itself - an experiment that hosts other experiments. Pooky Amsterdam: Yes it is and hopefully the rest will follow soon. Curious George: It aims to answer the question: how would you do research in VWs? Pooky Amsterdam: It makes this question so relevant because you are asking it as well. Curious George: Including the relatively mundane issues of having a purely virtual, serious scientific organization, how to run it, etc. Pooky Amsterdam: And of course this is a laboratory for much in this way of discussion. You don’t need to go to a mesa in Arizona, its incredibly cost effective as a retreat. Curious George: Yes, and cost-effectiveness is very important especially now, with the funding crisis. Already we can save a lot of research dollars if we don't travel, but meet here. Pooky Amsterdam: That’s immediate plus you don’t have to bring your suit to the cleaners. Curious George: Yes, it is a green technology - save the money, and the jet fuel. Pooky Amsterdam: And in the comfort of your own environment you are able to open up to the shared environment maybe SL is less threatening because of this - you are in your safe space in reality & so on this foundation of personal safety can express yourself more. Curious George: That's not so important to scientists - and there aren't too many of them who are too shy to express their ideas. Pooky Amsterdam: Wonderful really this has all the hallmarks of great success I would bet on it if I was a gambling woman. Curious George: Thanks, let's hope so. Pooky Amsterdam: thank you for the hour as well. Curious George: And pleasure talking with you, as always. Pooky Amsterdam: I will join KIRA . And I did and have been additionally enriched by the series of talks I have attended there as well. If you are interested in broadening your understanding of scientific and educational research and ideas, I urge you to join too. And please join MICA to learn more as well. We are very fortunate to have this high level of information available to us, which outside of a university setting, you would be hard-pressed to find. IM Paradox Olbers for this. Pooky Amsterdam is interviewed by JWheels Carver on making machinima and in creating her hit show The 1st Question and in the original Dating Casino. JWheels and Pooky have a great half hour conversation on vision, what audiences want and cook up some great steam behind how to create real entertainment in Second Life. A must listen. I walk the Science beat in Second Life, it is incredibly rich and diverse. It also includes education and technology. I am constantly amazed at the depth of resources, and their availability. which is the celebration of the date of Yuri Gagarin’s successful trip into outer space in 1961, and as the first human being to orbit the Earth. We will be celebrating this great human achievement with slide shows, and more. I even hope to pick up a copy of the space suit he wore. Yesterday night I worked on fixing the voting board which allows the audience in the StudioDome, where I broadcast my live show, http://www.the1stquestion.com/ to vote in real time from all over the world on which of the panelists’ ideas and / or inventions they most support. The panel this week was made up of a university administrator whose college hosted the Edward R. Murrow Awards, http://www.wsu.edu/murrow/winners.htm for journalism, and where Helen Thomas took the stage in Second Life and in real life. Also on my panel was real life science author Billy Marse, (SL name H3 Turbo) who just wrote a great treatise on Geology and in addition will be a leading light in a few weeks for Earth Week on Second Life, where members of the US House of Representatives will be speaking. I just received the Astro-news from the head of the Physics Club, Sl name Roger Amdahl, who sends out a weekly update of astronomical happenings. Yesterday morning I attended a lecture on NOAA weather satellites, Thursday morning I was at a lecture called, “Stellar Dynamics in a Virtual Universe,” a weekly workshop on setting up N-body simulations in virtual worlds at the MICA auditorium. MICA stands for Meta Institute for Computational Astrophysics. I will be submitting an interview I did recently here with the founder of MICA, Dr. George Djorgovski (SL name Curious George)of Caltech University who worked on the World Wide Telescope for MicroSoft, and is pioneering in his vision for and work in the virtual world known as Second Life for science education. I also attended Science Friday which is broadcast live over NPR, and which Dr Ira Flatlow hosts in Second Life to a very appreciative crowd. I found out about Science Friday from Troy McLuhan, (Real Life name Dr. Troy McConaghy PHD in AstroDynamics) who runs the science center and moderates the listing of inworld science events. http://science-center-group.wikispaces.com/Science-Related+Places told me about it. In 1998, two teams of astronomers observing supernovae discovered that the expansion of the Universe is accelerating. The speaker, Dr. Knop, was on one of the two teams, working with Saul Perlmutter. In this talk, I will describe just how it is that you can measure the expansion history of the Universe by observing distant exploding stars, and what surprising things we saw in our results that indicated to us that the expansion of the Universe was in fact accelerating. At the end, I’ll briefly mention some things about “dark energy,” the mysterious substance that is causing this surprising universal acceleration. This science talk is intended for the general public. All were welcome. Its part of a series of popular talks called Dr. Knop Talks Astronomy. I learned a lot, might not have understood everything, but for a person with a very active mind, being able to access information like this is unbelievably significant for me. where a fantastic lecture on"William and Caroline Herschel and the Invention of Modern Astronomy"was simulcasted (beamed live) into an auditorium there, given by Michael Lemonick — Science Journalist & Lecturer, Princeton University. I found out how an experiment William Herschel made with a thermometer, a prism and the rainbow of light it reflected led to the discovery infra red light. Wow! Attendance in the lecture also meant a chance to win a real life Galileoscope. It is a high-quality, low-cost telescope kit developed for the International Year of Astronomy 2009 by a team of leading astronomers, optical engineers, and science educators. Someone won the raffle (which will be an ongoing event) and it will be shipped to their real home, so they can watch the sky. If I win, I will donate it to my daughters’ school. If I wasn’t there, I never would have known about it. Troy just relocated the Science Center http://slurl.com/secondlife/Science%20Friday/33/146/22 to Info Island, http://infoisland.org/ where Loreli Junot (Real Life name Lori Bell), DaisyBlue Heffernan and Abbey Zenith, among others run the magnificently appointed Info Island, which has links and teleports to 43 Library installations and islands. http://slurl.com/secondlife/Info%20Island/112/105/33 Click on the Archipelgao board for more information. Here there are books, audiobooks, training programs, programs, medical library, science fiction portals, a fantasy gallery, events, a movie theater, exhibits, web resources and also the ability to create customized resources for people. The Alliance Liabrary system is magnificent! The Librarians were one of the first groups to realize the great economies of agglomeration to be found in Second Life. He said he had been accumulating so many books over his year on Second Life that he had to give them a home. A friend offered him some land on which to build, and here he is creating it for us, the residents who care about these things. There are a lot of us. has an incredible exhibit on the The Olmec who were an ancient Pre-Columbian people living in the tropical lowlands of south-central Mexico. There are pictures taken of Matthew Stirling of the Smithsonian Institution who conducted the first detailed scientific excavations of Olmec sites in the 1930s and 1940s. Stirling, along with art historian Miguel Covarrubias, became convinced that the Olmec predated most other known Mesoamerican civilizations. The dig and museum is an incredible learning experience and again I traveled to a part of the world I would never have found if it wasn’t for Second Life. The museum was designed by a woman, SL name Penelope Riggles who had been given a workshop by the person who is in charge of the Exploratorium in San Francisco and who curates and maintains the one here in SL, Patio Plasma. He also writes Isaac Asimovs old column. I have been to exhibitions on Charles Babbage, been introduced to the legendary figure who was Ada Lovelace, and found remarkable adventures in thought, education, science and more. All in the Victorian Island known as Caledon which has an incredibly rich and well resourced community for this important period in the time of the Industrial Revolutuon. I have seen the Mars Phoenix land on MARS, in an open air auditorium in The Scilands here with 90 other people who witnessed it live with me from around the world, while we had feedback from the actual control room at NASA. The SciLands are a restricted area in SecondLife devoted to the Sciences and Education. 45 islands now make up this illustrious area. The SciLands are my beat so to speak. I broadcast my weekly show, The 1st Question from here in The StudioDome, and make it my business to know what is happening around this great part of our metaverse in Second Life. * Island reservations in a pure Science region, with shared resources and other Science-based organizations, initially centered around the Space Industries and the acclaimed International Spaceflight Museum. * Shared resources, islands, events and networking for organisations interested in formal and informal science education, innovation, knowledge transfer and research using Second Life. * Access to our network of experienced Second Life residents and developers who value scientific accuracy and innovation. * An extended network of organizations interested in all aspects of informal and formal education using Second Life, including University Faculty, Government Agencies, Libraries, Museums, Subject Matter Experts and Educational Technology Researchers. The events held in the SciLands of second life are just like watching your favorite shows on the History and Discovery Science channels, except you get to be interactive, ask real questions, in real time, from real experts top in their fields. It doesn’t really get any better than that. I could go on, but I have to get ready for Yuri’s night, which is also being celebrated all over the world, and celebrated on Second Life. I will meet people from Russia who are attending to celebrate this achievement of this great human being who was one of the first to orbit the moon. And so from all over the globe we come together to realize what we can accomplish together. I just got a book called US Human Spaceflight, which was compiled by SL name Charlie Navarathna for the NASA CoLab Library & Archives. Head Librarian of which is Archivist Llewellyn. For those who are involved in the sciences, education and technology in Second Life, there are untold riches of discovery, learning, collaboration and more. We meet each other with a thirst for knowledge and an offered cup of wisdom which we share gladly and gratefully. I have heard other things go on in Second Life too, happily I keep this beat. Tune in to this channel for more of what’s really happening.